We are committed to providing ministries of compassion, mercy and justice and peace in our church, neighborhood, region and the world. Contact Irene – or any Missions committee member for more info or to sign up! There are opportunities for everyone! Cook and serve 25 dinners for homeless youth. Need folks to make cookies. Spring & fall. Cook and serve 40 dinners for homeless men. All of these programs can use your help! Please join us to share God’s love with people we do NOT know. Please bring non perishable foods for the Alameda County Food Bank, clean useable coats, and men’s socks for Berkeley Food and Housing. Thank you! BMUC is a partner in the Wadi Foquin Development Project and the Save Wadi Foquin Campaign. Through these efforts we encourage study/action tours to the village and Israel-Palestine, economic development of Wadi Foquin and political advocacy for justice and the safety of Wadi Foquin. Additionally, we are currently financially supporting the itineration of two Palestinians from the village. We also support United Methodist projects through the General Board of Global Ministries and United Methodist Committee on Relief, which have included assembling health, birthing and school kits, raising money for malaria prevention, and other global and national needs. All of these programs can use your help. Please join the Missions Committee as we share God’s love with people we do not know. There are opportunities for everyone who is reading this. The BMUC Missions Committee strives to provide a wide variety of opportunities for the BMUC community to participate in regional and local projects through monetary donations and direct involvement. Our ongoing service efforts include St Mary’s center (which supports people in recovery), collection of used clothing for the East Bay Rescue Mission (please place in vestibule closet), and nonperishable food donations for the Alameda County Community Food Bank. Contact Missions Committee to get involved. Additional projects are available throughout the year, and will be announced in the Sunday bulletin. Examples include Rebuilding Together, and UMW projects. “Diligently Work for Peace and Justice” has been represented by our ministry with Wadi Fouquin in Palestine. 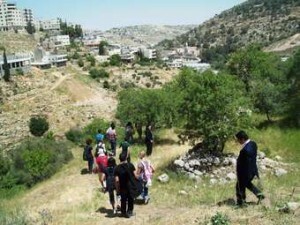 In 2012, one member participated in the invitation to “come and see” the conditions for Palestinians, and walk in the steps of Jesus. The “come and see” trips continue to be organized by Buena Vista UMC, and we recruited others to travel in 2013. We raised over $1000 and hosted UMC missionary Janet Lahr Lewis as part of the “Save Wadi Fouquin” campaign. In 2012, for the first time in BMU history (I believe), we have made an all-church (i.e., budgetary) commitment to mission, specifically, the support of Janet Lahr Lewis. We have active members who participate in various ways in Wadi Fouquin projects: Mike Friedrich, Lee Marrs, Irene Tekawa, Jean Hart and Richard Pearson have all attended meetings of the Wadi Fouquin support committee, and are helping out on various sub committees. Our BMUC Palestine Committee met in September to discuss the “Kairos Palestine Document” and plan additional ways BMUC can be involved in the campaign. Gordon Ung has been helping with an educational video on WF for its upcoming website. Additionally, Flora and Alice Ninomiya were part of a delegation to a congressperson’s office to develop support for the campaign. Jean Hart went to Washington, D.C. to meet with legislators to encourage them to agendize WF in the coming year. Mike, Lee, Irene, Jean, and Ruth attended a recent event on connections between Palestinians and Japanese Americans. Our members have been diligent! We look forward in the coming year to prioritize a local or national project for our peace with justice mission.